495. 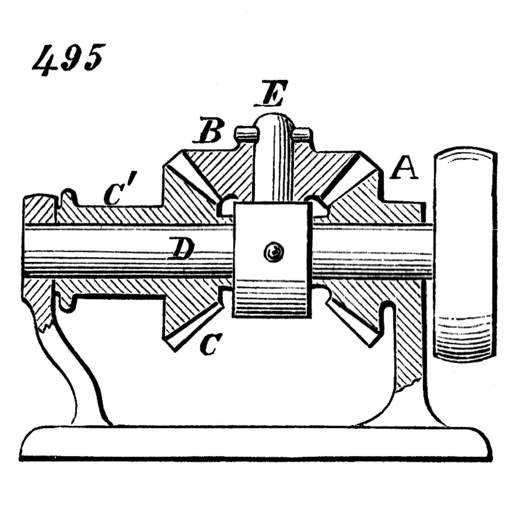 Entwistle’s patent gearing. Bevel-gear, A, is fixed. B, gearing with A, is fitted to rotate on stud, E, secured to shaft, D, and it also gears with bevel-gear, C, loose, on the shaft, D. On rotary motion being given to shaft, D, the gear, E, revolves around A, and also rotates upon its own axis, and so acts upon C in two ways, namely, by its rotation on its own axis and by its revolution around A. With three gears of equal size, the gear, C, makes two revolutions for every one of the shaft, D. This velocity of revolution may, however, be varied by changing the relative sizes of the gears. C is represented with an attached drum, C'. This gearing may be used for steering apparatus, driving screw-propellers, etc. By applying power to C, action may be reversed, and a slow motion of D obtained.